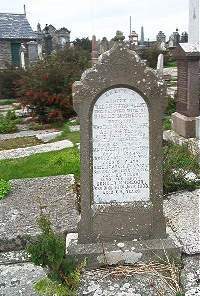 Helen Sutherland of Knockinnon died 1st August 1885 aged 64. Daughter Euphemia McGregor died 16th Febuary 1857 aged 1. Daughter Margaret McGregor died 8th August 1858 aged 7. Son John McGregor died 17th May 1872 aged 8. Daughter Elizabeth McGregor died at Southsea England 8th July 1872 aged 26. Husband Donald McGregor died 18th July 1888 aged 68.